This error might also cause a Blue Screen of Death error. Thus, it is important to resolve this issue as soon as possible to keep your system secure. Note: For systems using Windows defender, we need to perform the same troubleshooting for Windows defender since that would be the current security client. Eg. 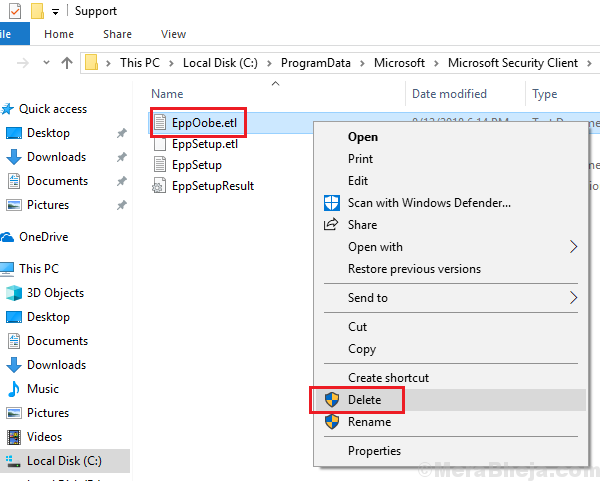 Kill the Windows defender process in the Task manager. One reason the Microsoft Security Client program stopped working suddenly is that the process might have gone corrupt. Restart the system and check if it helps. If it doesn’t kill the Microsoft Security Client process in the Task manager. 1] Press CTRL+ALT+DEL and select Task Manager from the options. 2] In the list of processes, check for the process msseces.exe. Right-click and select End process. 3] Restart the system now and check if the issue persists. If you are unable to find the process in the task manager, you could stop it from the Command Prompt as well. Where C: is the system drive. 2] Delete the EppOobe.etl file. The reason I mentioned to “completely” uninstall Microsoft Security client is because simply uninstalling it from the Programs and features menu wouldn’t be enough. Go to this link and download the tool mentioned in the “Fix it for me” section. Run that tool to scrape off all components of Microsoft Security Essentials from the system. 2] In the alphabetically arranged list, search for the service Program Compatibility Assistant Service. 3] Right-click on the service and then click on Properties. 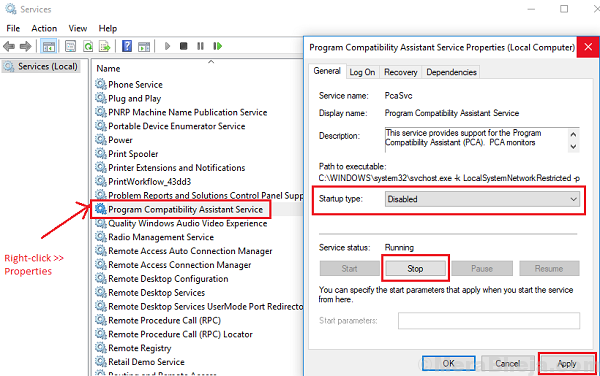 4] Change the Startup type to Disabled from the drop-down menu and the Service status to Stopped. 5] Apply the status and restart the system. Since it is a known issue, Windows might launch a fix pretty soon. The fix would be in form of a Windows update. We could update Windows from time to time to make sure we do not miss the same. While the issue is with Microsoft Security Client, it’s a known fact that it is caused by faulty graphic card drivers. We could update the same as mentioned here.